The java.util.Map interface represents a mapping between a key and a value. The Map interface is not a subtype of the Collection interface. Therefore it behaves a bit different from the rest of the collection types. A Map cannot contain duplicate keys and each key can map to at most one value. Some implementations allow null key and null value like the HashMap and LinkedHashMap, but some do not like the TreeMap. The order of a map depends on specific implementations, e.g TreeMap and LinkedHashMap have predictable order, while HashMap does not. 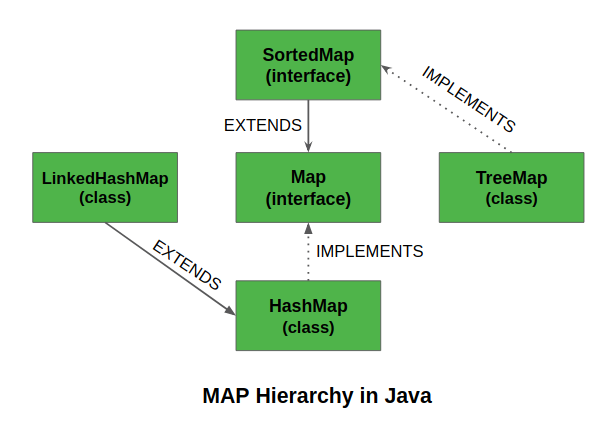 There are two interfaces for implementing Map in java: Map and SortedMap, and three classes: HashMap, TreeMap and LinkedHashMap. Why and When to use Maps? public Object put(Object key, Object value): This method is used to insert an entry in this map. public void putAll(Map map): This method is used to insert the specified map in this map. public Object remove(Object key): This method is used to delete an entry for the specified key. public Object get(Object key):This method is used to return the value for the specified key. public boolean containsKey(Object key): This method is used to search the specified key from this map. public Set keySet(): This method is used to return the Set view containing all the keys. public Set entrySet(): This method is used to return the Set view containing all the keys and values.